Ethiopia’s best-known opposition leader has announced she is quitting politics, at least temporarily, and is going to the United States. Birtukan Mideksa’s departure will leave Ethiopia without a prominent female politician. Mideksa, the leader of Ethiopia's Unity and Democracy for Justice Party, or UDJ, returned home from prison last October to wild celebrations in her Addis Ababa neighborhood. There was hope that the charismatic former judge might provide the spark needed to revive the country’s moribund political opposition. Birtukan was among opposition activists who were jailed for life after the disputed 2005 election. They were pardoned, but Birtukan was sent back to prison after the government accused her of violating the terms of the pardon. In all, she served more than three years behind bars, some in solitary confinement, before being freed. With Birtukan on the sidelines for the 2010 election, the opposition won only a single seat in the 547-member parliament. Groups allied with the ruling Ethiopian People’s Revolutionary Democratic Front, or EPRDF, won all of the remaining seats. When she was released from prison, four months after the election, Birtukan told reporters that she needed time to think about the future. In a series of text messages during the past week, the 36-year old single mother confirmed that she and her six-year old daughter would soon leave for an extended stay in the United States. 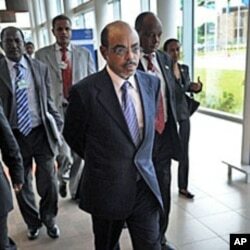 In her absence, the UDJ has appointed former Ethiopian President Negasso Gidada as de facto interim leader. Negasso said the party must respect Birtukan’s choice. But he spoke about what he said was the use of old style tactics to break the will of a promising and charismatic young opposition leader. "The system the EPRDF is following is the system of the old Soviet Union, where they imprison healthy leaders who challenge them, put them into prison and then let them out after harming them physically and psychologically," he said. "That’s the system of getting rid of opposition during the Soviet era. That seems to have happened." Birtukan’s departure comes at a bad time for Ethiopia’s struggling opposition and leaves the country without a major female political figure. UDJ spokesman Hailu Araya says opposition parties will boycott local and bi-elections later this month because it is impossible to compete in what he says is effectively a one-party state. "It doesn’t make any sense to be involved in an election, given the politically repressive atmosphere," said Hailu. "We see no point in engaging, in participating in these elections because there’s no way there could be a free and fair election. Everything is closed." Hailu says opposition forces face difficult odds in overcoming the EPRDF’s monopoly on power. He says the UDJ's strategy for the 2015 elections simply is to be a credible force that can channel what he sees as people's dissatisfaction with the government in a peaceful and constitutional way. He says it is likely that the political discontent sweeping many Arab countries will spread to sub-Saharan Africa. "It’s a question of when. We are beginning to see it in North Africa," he said. "And I think they are lessons for the rest of the world, for Africa in particular, for people who are living under repression. That’s why people are following what’s going on in Tunisia and Egypt, Yemen and other places. And one of our tasks of UDJ is to enable people to come out of this fear in a peaceful way, legal way." Ethiopia's Prime Minister Meles Zenawi in the past has played down the possibility of what he calls "color revolutions," a reference to Birtukan, whose name in Amharic means "orange." Communications Minister Bereket Simon was quoted recently as saying that opposition claims that the public is desperate for change stem from an inability to recognize Ethiopia’s strong economic growth. Speaking to a local newspaper, Bereket accused the opposition of advocating violence. He said, "whenever riots happen, be it the so-called orange or any other fruit revolution, if it is violence and street clashes that cost lives, the opposition are lured to it, and they want to emulate it here."